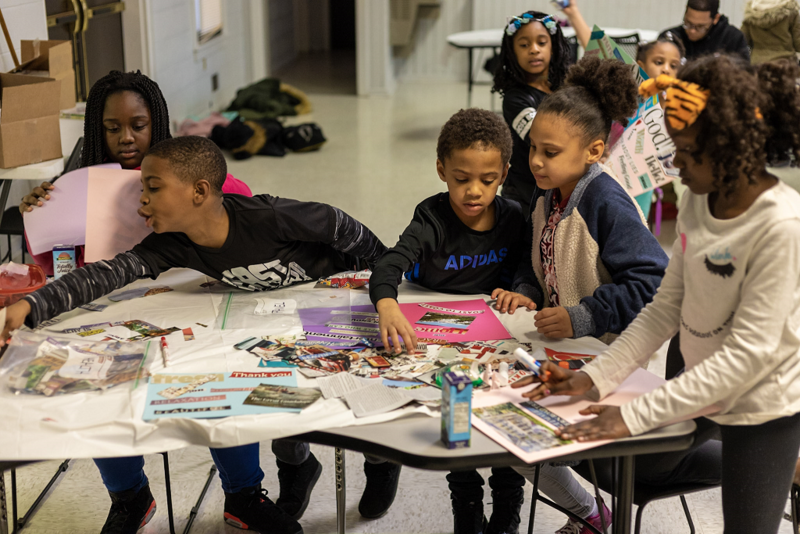 On a cold winter day in March, Terence Barber is sitting in the community center at Thomas Rolfe Court in Hopewell awaiting the arrival of a bus full of kids. Once a week, Terence leads an after-school program here for 28 children from the neighborhood. He teaches them about healthy relationships, how to deal with their emotions, safe touch, bullying, and coping skills to help them navigate life. We have a few moments to chat about his work with James House — a nonprofit that helps people affected by sexual violence, domestic violence, and stalking — and what it means to him. That is, until the doors open, and an enthusiastic group of kids bursts through. Terence Barber is a Prevention and Outreach Specialist at James House. On the day I visit Terence and this group of kindergartners through 7th graders, they are making collages. 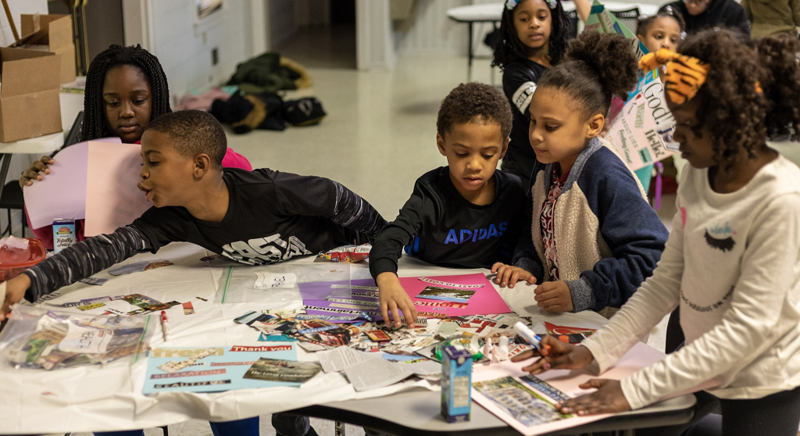 “Today, they get to visually represent what healthy relationships mean to them with pictures and words cut out of magazines,” Terence explains. They enthusiastically set about piecing their versions of healthy relationships together on large pieces of construction paper. Some represent themselves or friends in an uplifting way, as powerful and confident individuals. Others show pictures of family and friends with the words “love,” “feeling good,” and “joy”. “It’s important for children to learn to be aware of their feelings and how to handle those feelings. A lot of these kids have experienced trauma at home, and it’s hard for them to know how to cope,” Terence says. His goal is to break the cycle of trauma with kids to prevent abusive behavior as adults. Terence uses a variety of exercises and games in his work, but today art is the tool to teach them coping skills. Participants create collages around the topic of healthy relationships. Terence is able to work with this group through a collaboration with STORY – Southside Transformation Opportunities for Residents and Youth. 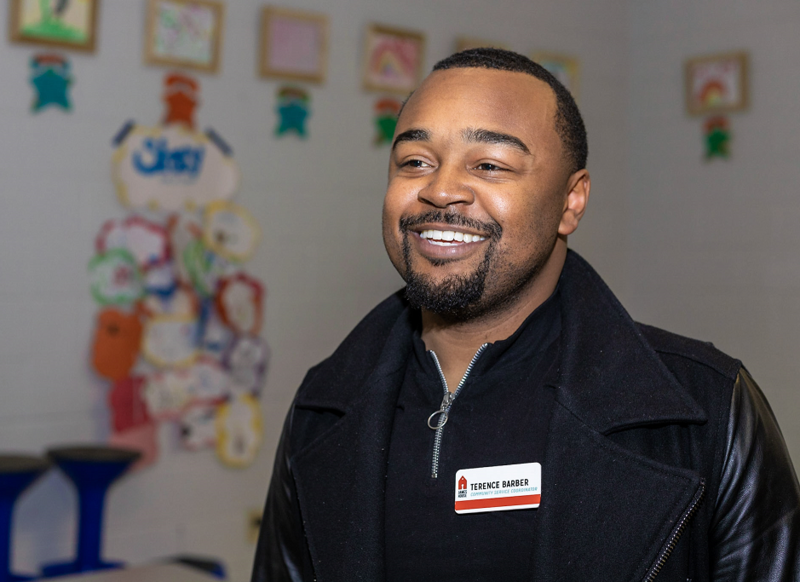 Rewriting the story of generational poverty, STORY brings in partners like James House to bolster their efforts. John Randolph Foundation supports both organizations through grants. While STORY is a new organization and a new grantee, James House is one of the Foundation’s first. James House and John Randolph Foundation actually share common roots at John Randolph Hospital over 25 years ago. Originally created as the “Sexual Assault Outreach Program” based in the emergency room, James House has expanded to help survivors of domestic violence and stalking, and to provide education and prevention services. So, in addition to their 24-hour emergency hotline, emergency shelter, and counseling program, a big part of their mission is to prevent abuse before it starts. That’s where Terence and the kids of Thomas Rolfe Court come into play. I ask Terence where his passion for helping children comes from. He explains, “As a kid, I always knew that I wanted to help young people excel in life. I just wasn’t sure in which capacity. As an adult, I’ve seen children and the effect that trauma has had on their lives. I want to teach them that it’s okay to express themselves and to find healthy ways to cope. It’s important that they learn about healthy relationships so that abuse doesn’t continue from generation to generation.” Whenever Terence gives a presentation, he feels gratified when kids feel comfortable enough to share their experiences and when they show that they are learning various ways to help themselves, as well as their family and friends. Youth from STORY’s ML2 After School Program enjoy programs from partner organizations like James House every week. From my perspective, the children really take to him. Terence floats from table to table, talking to them about their collages, what they chose to create, and what it means to them. For many of the kids, it’s the highlight of their week. The warm, bright smiles on their faces echo that. Thanks to a generous grant from John Randolph Foundation, these youth and many more will enjoy James House’s prevention programs and practice the skills they learn here in the outside world.